The Polish Air Navigation Services Agency (PANSA) had R&M install LAN cabling in the Air Traffic Control Tower at Kraków-Balice Airport. R&MinteliPhy monitors the LAN’s 15,500 ports. Every day, more than 2,500 civilian airplanes with around half a million passengers on board navigate Polish airspace. 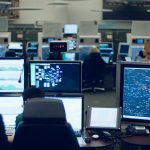 To make sure they all get to their destinations safely, 500 air traffic controllers from the Polish Air Navigation Services Agency (PANSA) are tasked with controlling air traffic. Due to the growth rates in air traffic, PANSA decided to modernize and extend its infrastructures. 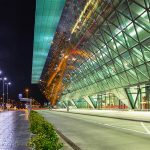 The most recent project was the Air Traffic Control (ATC) Tower at Kraków Airport. After a 17-month construction period, it was opened in February 2018. The 45-meter high-tech tower is responsible for three functions: approach control, airfield control and flight information service. The operations room, at a height of 38 meters, is currently Poland’s most modern workplace in the air safety and air traffic management area. Due to the high security and safety requirements in air traffic, PANSA also made special demands of the information and communication technology of the ATC Tower. Thanks to a compelling presentation as well as the long-established collaboration, PANSA and the general contractor decided on R&M as cabling supplier. For decades now R&M products have had a good reputation in the Polish air traffic sector thanks to their quality and operational reliability. 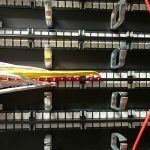 Along with safe cabling components, PANSA was looking for a new kind of solution for network monitoring and management. 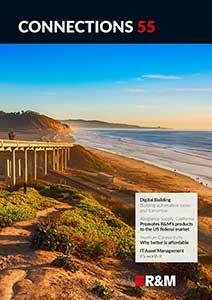 The LAN infrastructure with 15,500 ports has to be documented and monitored electronically without any interruption. This was the second most important planning criterion after security/safety and quality. Consequently, there was particular interest in R&MinteliPhy. After a product demonstration, it was clear to those responsible that this was the key to the desired operational reliability, transparency and automation in the new tower. R&MinteliPhy allows users to detect and localize physical connection problems in real time and rectify them immediately. This represents a significant increase in the operational reliability and degree of availability of the network. R&MinteliPhy is used to document the LAN infrastructure centrally on a server. The one-hundred percent overview of ports, assets and sites created automatically makes an IT officer’s work much easier. 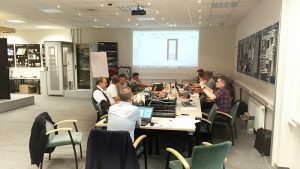 Together with installation and service partners Elektromontaż Rzeszów and API Smart, R&M quickly took care of the cabling tasks. They succeeded in adhering to the tight schedule and mastering a number of challenges. Among other things, a special team had to be put together and trained for the extensive implementation of R&MinteliPhy. PANSA is rapidly continuing the investment program. 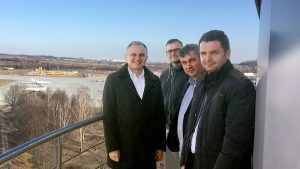 The ATC Tower at Katowice Airport will also be equipped with the same R&M solution. The flight safety agency also had its data center and its Air Traffic Management Center equipped with a new LAN from R&M.